Early in 2013, Lee Wilson, Director of Egress Group Pty Ltd embarked on a journey to write an evacuation guidebook for people with disability. It was during the research to prepare the book that he identified a major problem with exit signs currently provided in commercial buildings, facilities, ships and other forms of transportation. Lee realized that existing forms of exit signage do not consider the needs of people with disability, particularly those who find fire escape stairs a barrier. 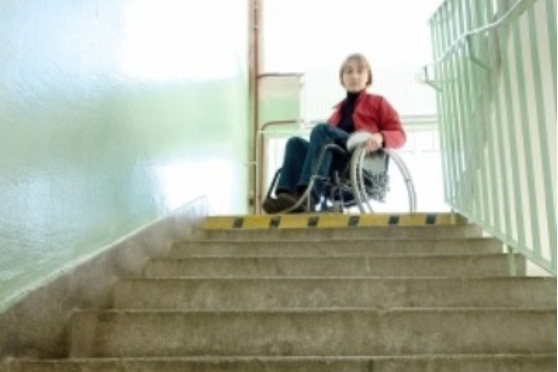 He asked: how do people that use a wheelchair know where to go during an emergency? 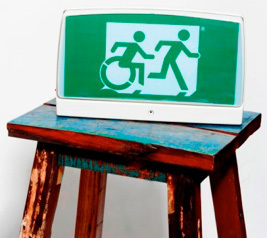 Later in 2013 Lee developed the ‘Accessible Means of Egress Icon’, which can now be used to help identify accessible egress routes, exit doors, refuges, lifts and other evacuation devices. The introduction of the ‘Accessible Means of Egress Icon’ onto exit signage changes the current discriminatory approach to emergency exit signs and presents a fully inclusive design. The combined ‘Running Man’ and ‘Accessible Means of Egress Icon’ shown above are working together to escape the building. They move in unison, display the same urgency and motion and appear to be travelling at the same speed. Their heads are forward, showing their haste. Arms are extended and motioning back and forth as they move through the doorway. The Accessible Exit Sign Project is an international awareness campaign that promotes the need for an accessible means of egress. The concept has been developed by Egress Group Pty Ltd as we think it is time to show where the accessible egress paths and exit doors are located. The website at http://accessibleexitsigns.com/ presents ideas on the concept of accessible exit signage, in the form of the example accessible exit signs. It is envisaged that in the near future these signs will become the norm and a minimum requirement in all new buildings around the world. The examples of signs shown on the website can hopefully start discussions between industry stakeholders, disability groups, legislators, developers, and insurers etc, to look at better building design solutions that provide safer buildings, reduce risk and meet the needs of all occupants. We believe that appropriate exit signage is a critical part of providing evacuation wayfinding information for all occupants. 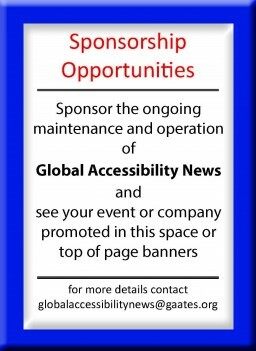 Please visit http://accessibleexitsigns.com/ or http://egressgroup.com.au/ to learn more. Printed with Permission from Lee Wilson.